Places to Visit in Juneau, Alaska ↠ Auke Recreation Area (AKA Sunshine Cove). 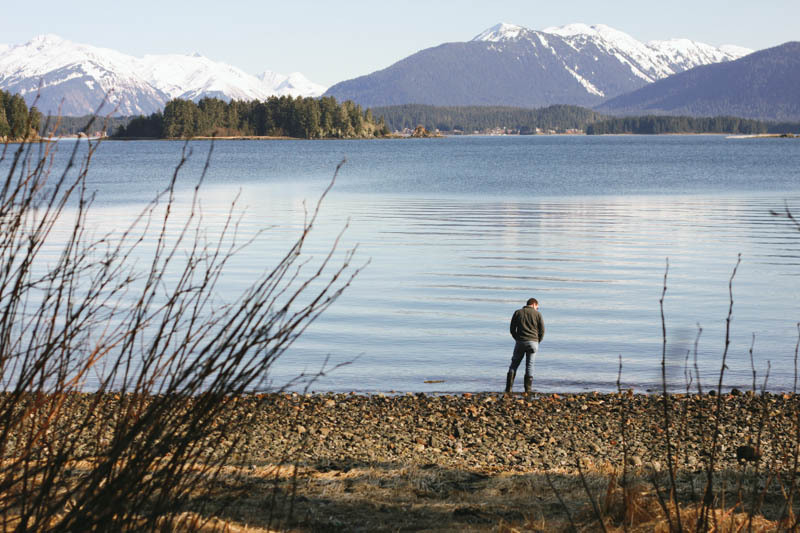 Auke Recreation Area is a beach on the northern shoreline of Auke Bay. This beach in Juneau is a gorgeous spot filled with picnickers, kayakers, dog walkers, and everything in between. Dave and I decided to check out the area when we were driving up North by Lena Point recently. This spot is filled with the most beautiful landscape scenery and a perfect spot to sit and take in all the beauty of Alaska. This was also the first spot we took Atka as soon as we got her. We wanted to let her walk around after being in her kennel for the whole plane ride over and take her time in bonding with us both. It was so crazy going back the very next day, after our first trip to Auke Rec the night before, this time with our new puppy. We had sat and soaked up the sun the evening before and wished we had a dog to walk around the beach with us...we had no idea that later that night I would find Atka online and within 24 hours she would be at the beach with us! Needless to say, the Auke Rec area has a special place in my heart. I'm already planning our next trip out there, next time I'll be bringing a blanket and food for a picnic! More places to visit in Juneau, here.